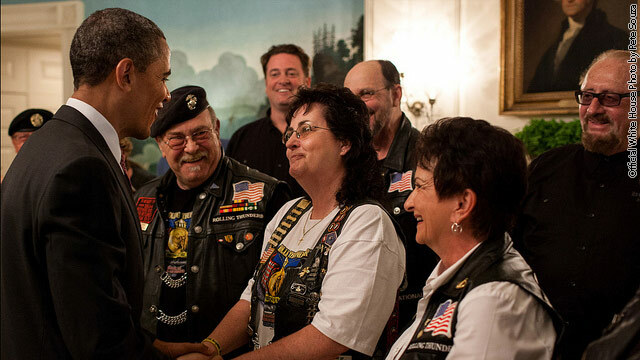 President Barack Obama greets members of the Rolling Thunder Friday in the Diplomatic Reception Room of the White House. This Memorial Day weekend 400,000 bikers will converge on DC for their 25th anniversary ride to honor veterans. Having lived through 9 presidents since becoming a Vet, and having to deal with the apathy and rejection of an ungrateful American people through most of it, I can honestly say that no administration prior to Obama has done more for Veterans. No administration has improved the VA more and no administration has simply cared more for Veterans since the end of WWII. I have been there and lived it. I am very grateful for what this administration has accomplished for all disabled Veterans. But, I fear a return to the dark days of the VA should the Republican-Romney budget ever be enacted. Thank you Sir, I am one grateful disabled Veteran. I think what Chris was trying to say is if you use the wrong word too often and to refer to everyone you cheapen its meaning. Maybe you should read what U.S. Air Force Lt. Col had to say on this exact subject. This is not said to deny that many who serve are heroes, and to every member of a fallen service man that son,daughter, father, mother, husband, wife, brother, sister, or relative is a hero...but truthfully the word hero has its own definition. NO JEAN, LETS NOT SUGARCOAT IT. HE FELT UNCOMFORTABLE CALLING THEM HEROES BECAUSE IT MAY SEEM TO JUSTIFY WAR. HE DOES NOT HOWEVER DISRESPECT THEIR SACRIFICE. OF COURSE, HE GETS ATTACKED VICIOUSLY FOR THAT FEELING. I APPLAUD CHRIS HAYES FOR SAYING IT LIKE IT IS SINCE MANY OF YOU ARE SICK OF THESE POINTLESS WARS. TELL IT TO THOSE WHO LOST THEIR LOVED ONES THAT IT'S ALL OK BECAUSE THEY WERE HEROES. I AM SURE THEY WOULD VERY MUCH LIKE TO PUNCH YOU IN THE FACE. It's no surprise that you applaud Hayes remarks. You and Hayes are lucky to have those that will fight and die for your right to say what you want even if you ridicule us in the end. However, Chris Hayes stated exactly the same thing as retired U.S. Air Force Lt. Colonel William Astore does in the following article...from the LA Times. Lt. Colonel Astore should know more about the subject than rum-dums like duce and bobby joey. Frankly most officers do not applaud war, and fact is far too many wars are pointless...regardless of that, in the end, this should take nothing due of the respect due those who served. And I don't think Chris Hayes was taking anything away from pointing out truth and facts...We have too many posting here that ... Can't Handle the Truth. OUR MILITARY IS COMPOSED OF VOLUNTEERS, THAT IS WHAT IS TRULY HEROIC ABOUT IT AND HAYES ADMITS TO THAT. FACE IT, WHEN WE CONTINUE TO HAVE WARS LIKE IRAQ AND WE ARE FORCED TO ENLIST, NONE OF YOU WILL FEEL VERY HEROIC ABOUT IT. ANYWAY, HE'S ALREADY APOLOGIZED THOUGH FRANKLY THERE IS NOTHING WRONG WITH HIS POV. Thank you to the bikers for remembering our fallen heroes. Lt. Colonel Astore teaches at the Air Force Academy. "Senate Bill 82, containing a provision for a "Medal of Honor", was signed into law (12Stat329) by US President Abraham Lincoln on December 21, 1861"
So while an article was written by an Lt Col, A president signed the law to create the MOH, which denotes herosim that is above and beyond te call of duty! Last time I checked a President outranked a Lt Col! .